Cats and kittens like to eat little and often, so the daily serving should ideally be split into several smaller meals throughout the day. Supply plenty of clean, fresh drinking water at all times. What is the expected adult body weight? In most cases, all we have to go on is the weight of the mother but remember that, in general, the male kitten will be around 30% heavier than its female littermate at maturity. So, if the mother weighs around 3.5kg, then that’s a good estimate for the female kitten’s final weight, but the Tom could be a whole kilo heavier at around 4.5kg. What is a normal cat? We think that he or she has the correct bodyweight, spends a lot of time sleeping and grooming but is allowed to roam outdoors and enjoys a regular play session with their owner. If you think your cat is overweight, you should speak to your vet before starting a weight reduction programme. 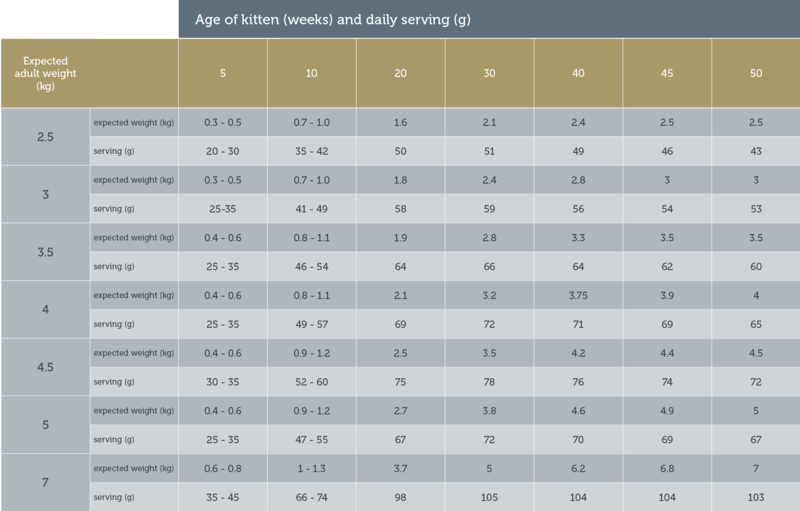 Too rapid a loss can be dangerous for your cat so it is important to weigh your cat regularly to ensure that weekly weight loss is no higher than the maximum given in the table below. 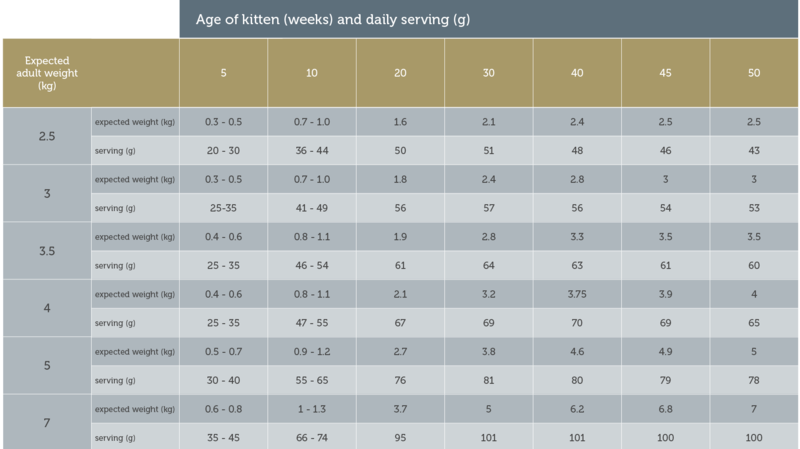 Our feeding guide is worked out for the average cat of the weight shown but your cat could differ substantially from average – requirements vary considerably between cats of the same weight. The predicted weight loss is based on a 15% reduction in calorie intake from the level necessary to maintain current weight. If your cat fails to lose weight, you should consult a vet. If feeding both wet and dry food during the day, reduce the daily allowance of dry food by 20g for every pouch fed. The recommended daily serving is only a guide as requirements vary considerably from cat to cat and can depend on whether other foods are also offered. Ideally, split the daily allowance into numerous meals throughout the day – cats like to be fed little and often. Feed at room temperature. If the whole pouch is not used, refrigerate unused portion. Supply plenty of clean, fresh drinking water at all times.